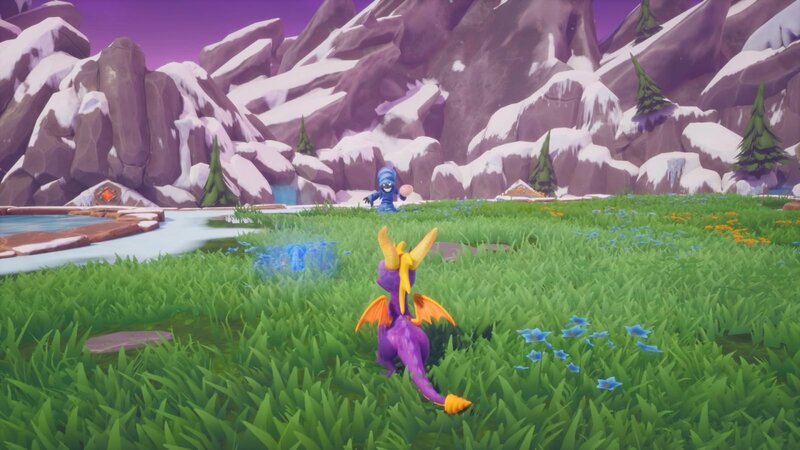 When the Crash Bandicoot N. Sane Trilogy was announced, Spyro fans had hope that the purple dragon would be next to receive an HD makeover for his breakout titles. After all, Spyro is the Jelly to Crash’s Peanut Butter in a PlayStation platformer sandwich. They didn’t have to wait long, as a little over a year after the Crash Bandicoot N. Sane Trilogy was released, the first three Spyro games came to modern consoles as the Spyro Reignited Trilogy. But, with Crash Bandicoot setting the bar for what it means to be a remaster of a beloved trilogy, could Spyro even dream to burn as bright? The answer, of course, is that Spyro doesn’t just clear the bar, he soars above it. Yes, speedways are just as difficult as you remember, too. Spyro Reignited Trilogy contains from-the-ground-up remakes of the first three games in the franchise: Spyro the Dragon, Spyro Ripto’s Rage, and Spyro Year of the Dragon. It was made in unity while the team used their own tool, Spyroscope, to get data from the old games, allowing Toys for Bob to be as faithful to the originals as they can. If you didn’t know this, it’d be difficult to learn that it’s not actually the same game with a makeover. All three games in Spyro Reignited Trilogy plays nearly identicle to the original games from around 20 years ago. You’re able to jump, glide, charge into enemies, and hit them with flames in each of the games. Spyro Ripto’s Rage and Spyro Year of the Dragon allows you to do a brief hover at the end of your glide to get more distance as well as learn more moves such as swimming and head bashing. If anything, these moves feel more fluid now than they did back then thanks to the updated controls and dual analog support. Everything pops out so vividly, it’s beautiful. The most obvious change is the visual overhaul. Spyro Reignited Trilogy doesn’t just look better compared to the originals, it’s downright gorgeous even by today’s standards. I was playing on a standard PlayStation 4 and the game was beautiful, so I can’t imagine how good it must look on a PlayStation 4 Pro or an Xbox One X. As this is a game three generations later, some of the character models needed to be updated, as they were originally based around the limitations of the PlayStation 1. Some of the dragons have new poses, like this guy begging you to paint him. This includes all of the dragons in Spyro the Dragon. Originally, there were only a handful of models that you would run into when rescuing dragons. This time, every dragon has their own respective model based on their homeworld. For example, dragons in the Artisan Homeworld will have an artist flair to them like they’re holding a paintbrush. Dragons in Peacekeepers will be decked out in battle garb because they, well, “keep the peace.” You can tell how much fun the art team had with these designs, and it gives the world some much-needed depth. The Ripto’s Rage gang is all here, looking a little more fluffy than usual. This makeover wasn’t only for Spyro the Dragon. Every character across the trilogy got a makeover with some taking a few more liberties than others. Elora’s face is more animal-like in Ripto’s Rage, and Hunter looks more like the young-adult skaterdude we all saw him as when we were younger. Some of the animal friends in Year of the Dragon may seem a bit off to die-hard fans. Sheila, the Kangaroo, now has a head of hair and a crocodile hunter-reminiscent outfit. This is most likely a tribute to the late Steve Irwin, as Sheila is unapologetically Australian. I seriously love the way she’s pouting and drawing daggers towards Moneybags (off screen). Spyro and Sparx themselves aren’t looking too shabby either. Spyro’s makeover is completely in line with his original model, and he is much more expressive now. As is Sparx, the dragonfly. He’s been given a set of arms that he can use for more expressions such as waving at the camera. Look at those little faces, all ready to torch some Gnasty Gnorc. My biggest complaint with the graphical overhaul is more about what they didn’t add, though it can be completely justifiable. Year of the Dragon does not appear to have as much care put into the baby dragons as was done in the elder dragons in Spyro the Dragon. They all feel fairly basic, with the biggest charm being their expressions, but some of these designs repeat after a while. Of course, this could be because there is a much larger number of baby dragons compared to elder dragons, but there is definitely a contrast. Besides this, they’re still adorable. Their big goofy eyes and bashful nature kill me. Spyro Reignited Trilogy isn’t just a game I’d recommend to old fans, I’d recommend it to anyone that likes platformer games in general. All three games in this collection are worth playing through and while they may not all be of the same quality (Year of the Dragon gets some sort of flack), the worst of the three is still a good game. Each game in the trilogy shares a common goal: run around open levels, find the McGuffin in said levels (Crystalized dragons, orbs/talismans, Dragon eggs), and find gems. Remember how these guys used to not have a voice? Everyone speaks their dialog now. The Reignited Trilogy rewards exploration. Finding everything unlocks special bonuses within the game including additional cutscenes or a final level for each game. When everything has been found in these games, you can still go for “skill points,” which unlock art galleries in each of the three titles. Skill points made their debut in Ripto’s Rage, but Toys for Bob decided to add them into Spyro the Dragon. They seemed so fluid with the rest of the game that I had to think hard about whether or not they were actually in the original title. Most of the skill points are things like “don’t get hit” segments of the levels or bosses, but there are a few that require you to complete a speedway level as quickly as you can. I wish could be half as happy about anything as she is about her Yo-Yo. The music has received an overhaul as well. While players can use Stuart Copeland’s original tracks in the game, the Reignited versions of the music are extremely faithful, often sounding like a higher quality version of those tracks. The dynamic music feature is integrated well, which means that different conditions will change how the music is played. If you are in a cavern, the music will have a reverb, if you stand still for long enough, the music will become quieter in favor of an ambient sound, and if you are charging, the music will change slightly, either by adding more drums or a rhythmic pattern to go along with your running. There is also an alternate version of these themes that plays after the original theme plays through once. It’s not drastically different as it only does something like drop an instrument, but it does prevent the music from getting stale. There are minimaps now, as well. It’s hard not to compare the Spyro Reignited Trilogy with the Crash Bandicoot N. Sane Trilogy. Both icons stood side-by-side during the PlayStation 1 era, they were both platformers rivaling Mario, and they even had a pair of crossover games on the Gameboy Advance. However, unlike the Crash Bandicoot Trilogy which had three games of drastically varying quality, Spyro Reignited Trilogy has three great games with consistent quality across the board. Every game in the Reignited Trilogy has something worth going back to, and with the visual overhaul and new sound design, Spyro is better than ever. With three titles of great quality being redesigned to be beautiful even by today’s standards, the Spyro Reignited Trilogy burns bright. Little touches such as a unique design for every Elder Dragon, an attention to detail in the aesthetics of the levels, and a dynamic music system breathe life into what was already a lively collection. Spyro is back, and his games are exactly as good as you remember. All of the redesigns, from scenery to characters, are beautiful. Music is faithful to the original tracks while bringing welcome, new twists. All three of the games are fun and deliver a quality gameplay experience. Updated controls with dual analog support translates well across all three titles. Baby dragons have not been given the same level of care as Elder Dragons. Some fans may be upset with some of the character redesigns.